Ever since they were founded, nearly everyone has wanted to own them in their home gyms or other training facilities. But more often than not, finding the best elliptical machine has turned out to be an overwhelming task for many. On Ellipticalist.com we try make things pretty easy for you. We understand that taste and budget count a lot in selecting elliptical machines. You will also want to make the most of out of it and for that, we have stacks of details to take care of your questions and concerns. With tons of reputable international sporting organizations sharing a similar story of elliptical trainers being the ideal total body workout machines, you wouldn’t want to be the only one left out of this fad. So grab your popcorns, sit back, and enjoy the tour. No one wants to see their money and time go into waste which is perhaps the reason why you need some decent knowledge when purchasing this fitness machine. What’s actually best for you is an elliptical machine that you will enjoy to use time and again and a price you won’t moan about to your death. So here’s how to go about it. Our desired fitness levels certainly aren’t similar. Whereas some are of us are out for an intense workout, others simply want a normal workout that will get the sweat dripping from their face, armpits or palms. Ellipticals that fall on the higher side of the price range tend to be more solid, smooth in their operation, and possess superior ergonomics as opposed to those under $1000. So what’s ideal for you is what compliments your desired fitness level. Stability and price go hand in hand. Ellipticals that are well built, sufficiently stable and with few defects in the long run mostly cost $2000 going upwards. Note that this doesn’t mean you won’t find a good machine for less than that. What actually sets the two apart is the quality score which for the record seems to be high for ellipticals costing way above $2000. Most ellipticals have an average length of 6 feet with the width measuring 2.5 feet or thereabouts. A good number also have measurements lesser than this. So first of all, check your ceiling height and room space. Since a large percentage of them don’t fold, make sure you have enough space to keep it because they take as much as space as your dining room table or couch. Which type of user are you? A teenager? An aged man or woman? A middle aged man? Note that this machine can be quite dangerous to children or people who’ve seen better days. Very few ellipticals are actually safer for users of all ages. So ensure you squeeze all safety details from your seller or manufacturer before purchasing this machine. There are various types of elliptical machines and they can be distinguished based on 3 things; Type of resistance, Flywheel placement and Function. These machines utilize various types of resistance to challenge your workout. You can decide which is best for you based on the resistance it utilizes. Apparently, there are only two types. Ellipticals that utilize magnetic resistance are famed for not only being quiet but also possessing the most consistent and realistic workout experience. 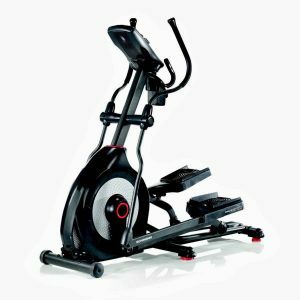 Ellipticals that utilize this type of resistance mostly fall on the lower end of the price range and one thing that’s so likable about them is that you will experience a very smooth ride when working out on them. Many people are ever left in confusion as to which elliptical machine to choose based on the placement of the flywheel. Each position of the flywheel has its own good and bad. So let’s examine each of them. Even though their price is a bit higher, what you get is real value for your money. As much as all ellipticals perform a similar function of helping you to get fit, not all of them are similar in what they do to your body. Each of the types we shall look at does a specific function to your body. An elliptical trainer only works out your lower side of the body. On top of the foot pedals, they also have a stationary handlebar which you should hold onto when working out. It works the glutes, quads, and hamstrings. An elliptical cross trainer works out both the lower and upper side of your body. Other than the pedal platforms, it has handlebars that are moveable so as to work your upper side. Through its many mechanisms, you can work your elbows, shoulders, back and chest. An elliptical glider is in many ways similar to an elliptical trainer. It has stationary handlebars, unmovable arms, and foot pedals. Unlike the elliptical trainers and cross-trainers which move in a circular motion, the glider moves up and down. It also enables you to peddle both forwards and backward. Note that you can only experience the resistance when you peddle forward. You will of course want to find out why you should use an elliptical machine in place of a treadmill, an exercise bike, a rower or any other fitness machine that comes close to it. In reality, ellipticals are very effective. Not only that but they also offer a full body workout which is something you won’t ran into easily with the other fitness machines. 20 or 30 minutes on this machine is enough to shoot your aerobic capacity to incredible levels. In fitness, aerobic capacity is everything. While on this machine you will break a sweat and feel your heart rate shoot to crazy levels. And when the aerobic capacity is high, it becomes even easier to work out for longer periods without gasping heavily. Ellipticals have also been shown to be a safer option for folks who suffer from arthritis, osteoporosis, ligament tears and other bone or joint conditions. What’s perhaps more striking about elliptical machines is that you can shave off up to 400 pounds when exercising on them for just 30 minutes or less. Isn’t that spectacular? Well, even the Harvard Health Publications agree to this. There’s even more. Aside from all these, you can multitask while exercising on it; you can enhance your mobility and balance; you will enjoy low maintenance costs, and best of all, you can mimic as many different types of workouts as you want all on this machine. With as little as $100 or as high as $2800, you can still get an elliptical machine. In between these prices, there are dozens of different types of ellipticals. You need a guide? Well, we’ve got it. We have picked what we feel are the best elliptical machines right from the lower end to the highest end of the price range. If you want a taste of the latest technology in exercise, this is the machine you should consider first. For its high price ($2700), you get more value than you could ever ask for. Any fitness enthusiast will admit that you can only get the smoothest ride in the fitness industry when you use this machine. What’s more! It can accommodate all types of users. Even though it costs an arm and a leg, this hasn’t stopped people from wanting to own it. And you’ll see why. Looking at its quality features, Sole E95 is definitely a machine to have on your shortlist. Remember that it has one of the smoothest rides ever and it’s ideal for all types of users. Not forgetting to mention that it has a lifetime warranty on the frame. Even with its few weaknesses here and there , Sole E95 easily takes the crown as any person’s favorite elliptical. Read our full review of the ProForm Hybrid Trainer. If you treasure silence in the midst of an intense workout, Schwinn 470 is your ultimate choice. Coming from an esteemed company, Schwinn 470 packs everything you would find in a decent fitness machine. One great feature of this elliptical machine its smooth workout experience. If you are looking to getting fit in no time, Schwinn has every feature to help you achieve your goal. It also packs a set of intelligent computerized features that will make your workout experience incredible. Overall, the Schwinn 470 is a decent and great choice for fitness enthusiasts but is it without any faults? Well, let’s find out. 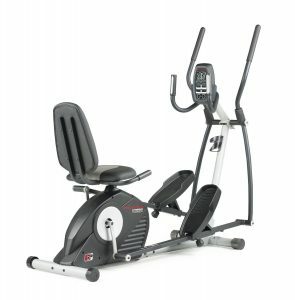 For only $1299, Schwinn 470 offers pretty much everything you would expect from a decent and quality fitness machine. Schwinn is an esteemed company and much of what they included in this product makes it a solid buy. On top of the stability, strength and durability, you will also get to enjoy its innovative computerized features and smooth workout experience. Overall, it makes a great but for home use. Nautilus is a well-respected brand and one of the latest fitness product on the market today, the Nautilus E614 is their creation. Even though it’s the youngest on the market, people won’t stop obsessing about it. Nautilus E614 is packed with dozens of quality features yet it comes at an affordable price of $999. One thing that will steal your heart is it’s uniquely designed DualTrack LCD monitor. It’s also very stable and durable. For its price, Nautilus E614 is way beyond what its close rivals can offer. 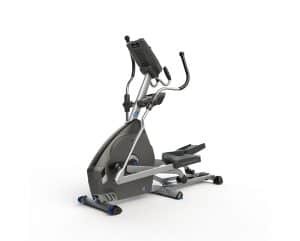 Nautilus E614 is worth every coin you spend on it because it comes packed with so much that you wouldn’t expect in ellipticals retailing under $1000. When it comes to performance, it offers a very smooth workout. It’s also very modern, durable and well built. Adding the great warranties together with its quality features, this machine is definitely makes a great buy. 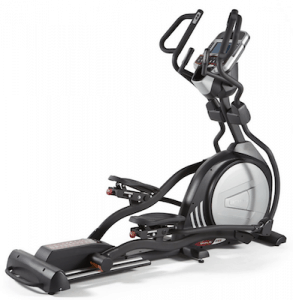 ProForm Hybrid Trainer has for long been a favorite elliptical to many fitness lovers and looking at its latest edition, you wouldn’t want to be left out in having it in your home or training facility. With its heavier flywheel, expect a very smooth workout experience. Ease of use has also been enhanced, thanks to its many adjustable features. Not forgetting to mention that it’s aesthetically appealing. You wouldn’t even care much having it anywhere around your home because it can complement almost any look. ProForm has also not been without its share of disappointments but overall, it impresses more than it annoys. What impresses most about this elliptical machine is its two-in-one design. For its friendly price, you surely wouldn’t ask for more. It also presents a great workout experience and on top of that, it’s strong and very durable. Even though it has its own share of features that some users find to be quite wanting, truth is many people like ProForm mostly because it does its job so well. Its price looks like a joke but don’t take the joke too far before checking out what it packs. Exerpeutic Aero Air Elliptical is one of the quietest ellipticals ever and it’s also well-built to overcome the hardest of punishments. You will fall in love with its resistance, which is so smooth and adjustable. When it comes to intelligence, it has a set of computerized features you will definitely enjoy to use. On the whole, Exerpeutic never compromised on quality when they priced it this machine at $139. You will be able to prove this in a minute. If you simply want to enjoy a great workout without digging deeper into your pockets, Exerpeutic Aero Air Elliptical is your ultimate choice. Even though it doesn’t pack a dozen fancy features, this elliptical does its job like a faithful servant. Read our full review of the Excerpeutic Aero Air Elliptical. One thing that has come out clear in all the views we’ve assembled from fitness and health professionals, popular sportsmen and sportswomen, fitness magazines and sports associations, is that ellipticals make the perfect option when one wants to stay fit and healthy. Each of them agrees that ellipticals offer a total body workout with tons of benefits on top. Ellipticals target not only the lower and upper side of your body but also every muscle. Keep in mind that the high-end ellipticals offer just enough to help you gain the most out of your fitness goals. Looking at its benefits, we can all agree that it packs everything you will love to see in a fitness machine. Realizing your fitness goals while utilizing this machine is the easiest you will ever come to achieving success. Even though it faces stiff competition from treadmills, exercise bikes, rowers, name it, ellipticals easily take the crown mostly because they are safer and offer a complete body workout. In deciding which one is best for you, you will certainly encounter a few challenges but whenever you find yourself in this state, always remember that we’ve got you covered in every area and it’s absolutely free to visit our site again so as you can keep yourself well informed. So don’t hesitate to climb on that elliptical of your choice. With it, you have the perfect chance to get better day after day. Always keep in mind that the best elliptical machine is the one that will leave you satisfied all the time and comes at a price you are prepared to pay.